This is your roadmap to stopping an annoying and dangerous habit. Day One: "Whoever Moves First Loses"
Work from the saddle to lock in your "standing order"
Without realizing it, the way we use the reins often causes many aggravating issues. Here we learn five tips to improve our rein-handling - and take a giant step toward a happier partnership with our horse. Once you've "fixed" your horse at the mounting block, keep future attitudes and performance in balance by running each of these three checklists through your head with each ride. Think of this as "preventative care." The slightest resistance from your horse in the more peaceful moments - like when you're trying to mount up or even just hanging out - will be far worse at higher speeds or at traumatic moments, leading to balking, bolting - or far worse. If you can't "mount up" because your horse is half alligator at "tack up time," here's how to deal with the gnashing teeth, thrashing tails and stomping feet. 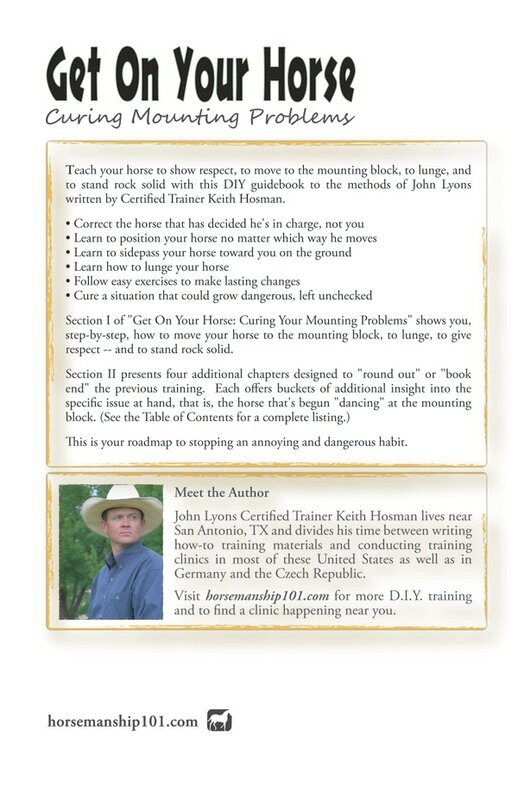 Teach your horse to show respect, to move to the mounting block, to lunge, and to stand rock solid with this 5-Day guide featuring the methods of John Lyons. Your horse will stand there politely, and fellow riders will have new and positive impressions of your skills as a horseman. This is your roadmap to stopping an annoying and dangerous habit. With additional training for added insight. Your horse dances about and tries to keep you from getting into the saddle because he's either scared -- or because there's been a coup in "your little herd of two." This handbook shows you the steps necessary to put an end to this annoying and dangerous habit regardless of its cause. 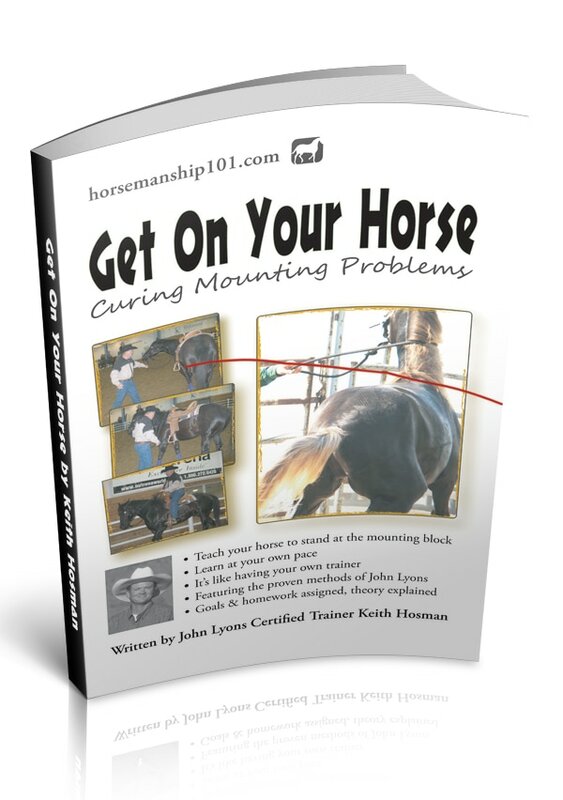 Section I of "Get On Your Horse: Curing Your Mounting Problems" shows you, step-by-step, how to move your horse to the mounting block, to lunge, to give respect -- and to stand rock solid.